I have difficulties to create an indexed query and don't find what's wrong or missing. Last edited by GLR on Thu Jan 16, 2014 12:54 pm, edited 5 times in total. Read the documentation ( http://docs.cacti.net ) on how to do this, or take a look at some of the other templates. Is it supposed to be better ? Yes, this is the new option I've tested following your advice. Any SNMP indexed query expert ? 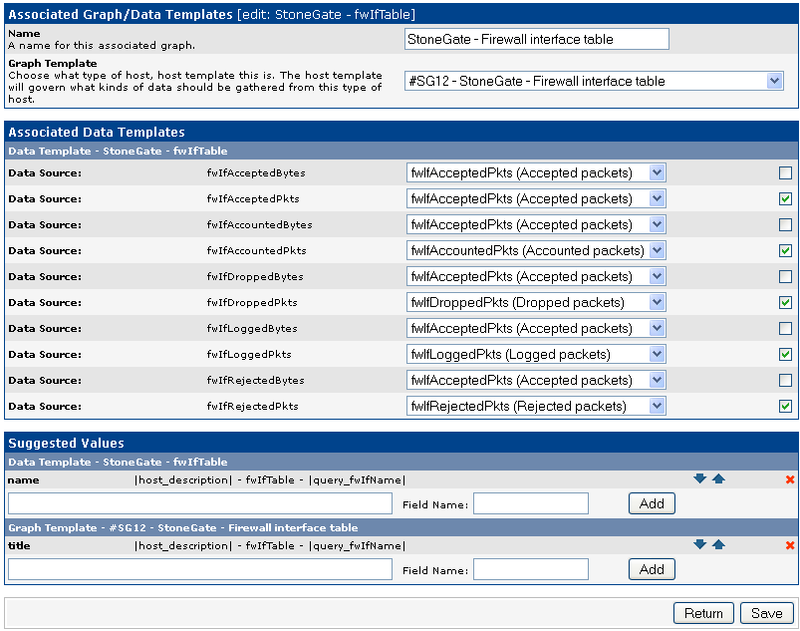 Here is the StoneGate 5.3 host template. It seems that your device doesn't return fwIfStatsIndex OIDs.. why? "<source>index</source>" will use parsed index for it. ... And thank you for your help ! R&D tells that OID 1369.5.2.1.10.1.1 is fwIfStatsIndex, which is in our MIB described as not-accessible - as a 1369.5.2.1.10.1's sequence index, there's no need to access that. In your "Indexed query definition", please make sure whether all datasources are selected properly (and enabled checkbox). If it worked, I can't understand why can't re-use index value for <source>.. This way, it seems to work ! I will confirm later and provide screenshots, but it seems to be a success. Thanks so much !!! May be this last one was one of the main changes to be applied. Do you want to test again one of the previous syntax for <fwIfStatsIndex> ?